PWCC and Future Aerospace hosted the 2018 International Salon of Commercial Space Industry Development and Investment to look at new opportunities in the field. Click here to read this story in Chinese. 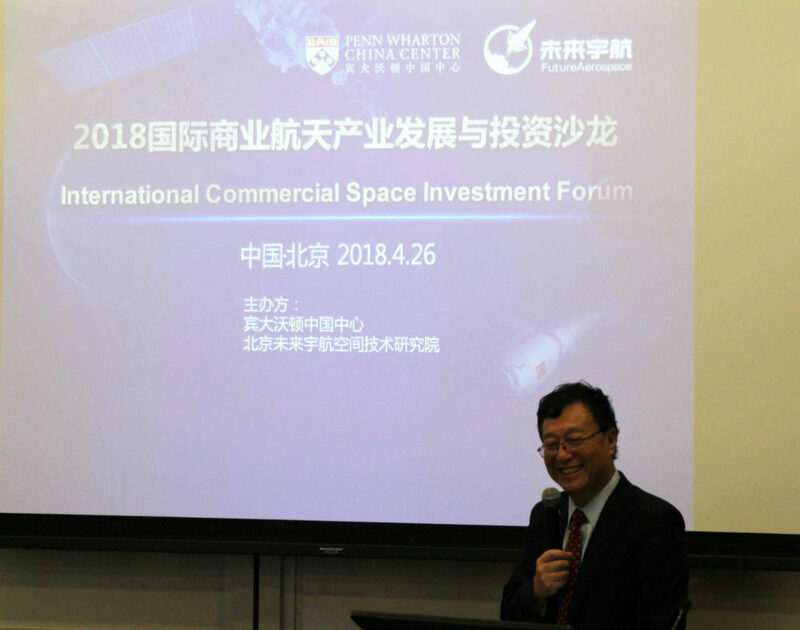 Experts, entrepreneurs, and investors from China and abroad gathered at Penn Wharton China Center for the 2018 International Salon of Commercial Space Industry Development and Investment to discuss future trends and investment opportunities in the field. Hosted by PWCC and Beijing-based think tank Future Aerospace, the forum in downtown Beijing attracted many Penn alumni and guests, including experts and key players in the commercial aerospace industry from China and abroad as well as high-level executives from China’s top investment organizations. 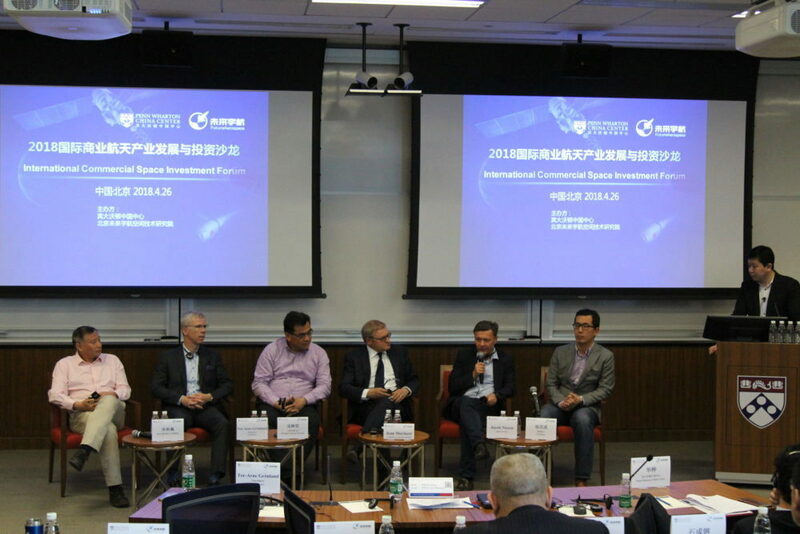 A panel of experts, entrepreneurs, and investors from China and abroad gathered at Penn Wharton China Center to discuss future trends and investment opportunities in the commercial aerospace field. The April 26 event came just days after China’s national Space Day, which celebrates the country’s achievements in aerospace and commemorates China’s success of its first satellite, the Dongfanghong-1, in 1970. According to a recent report from International Air Transport Association, China is projected to become the world’s largest passenger aviation market by 2024. PWCC Managing Director Dr. Gary Hua welcomed attendees and highlighted how China’s rapidly growing commercial aerospace industry has created new opportunities for investors and experts from all sectors. PWCC hosted the event, Dr. Hua explained, to facilitate exchanges to explore some of these new opportunities. PWCC Managing Director Dr. Gary Hua welcomed attendees and highlighted how China’s rapidly growing commercial aerospace industry has created new opportunities for investors and experts from all sectors. The global commercial aerospace industry has tripled in size over the past decade, Future Aerospace CEO Niu Min told attendees. He kicked off the forum, sharing his research and insights on promising areas of progress and cooperation in the sector. Niu also pointed out how China’s current policies will encourage further development of the country’s aerospace industry, as they could lead to innovation and reduce production costs. Tor-Arne Grönland, Founder and CEO of Nanospace and business developer of GomSpace, discussed the development of the nanosatellites especially CubeSat and its market potential. He talked about the development and history of his company headquartered in Denmark – from its beginning when he was a university student to developing a key partnership with the European Space Agency. Grönland explained how rapid technological advances have propelled industry growth and industry in nanosatellites, highlighting propeller and communication network as two key technologies that are making the nanosatellites business profitable. Professor Wu Shufan, Chair of the Department of Aerospace Information and Control at Shanghai Jiao Tong University, shared his insights on the industry in China and compared the development status of state-backed institutions, university-backed institutions, and those in the private sector. Zhang Changwu, Founder & CEO of Landspace, a private space launch company based in Beijing. Zhang Changwu, CEO of Beijing-based private space launch company LandSpace, established the corporation in 2015 and has witnessed more capital coming into the sector over the past two years. Zhang continued to stress that many of the challenges in the commercial aerospace industry can only be addressed with innovative management approaches. The event concluded with a roundtable discussion on the future of the commercial aerospace industry, facilitated by Niu Min. Leading experts shared their thoughts on China’s new technology development, its advantages in the world market, and their outlooks on future trends in the industry. Xu Congwei, Former Vice President of Beijing University of Aeronautics and Astronautics; Dr. Jean Muylaert from the von Karman Institute for Fluid Dynamics; and Jacob Mølbach Nissen, Space Inventor’s Chief Sales Officer, participated in the discussion. Dr. Muylaert said the best time is yet to come for China’s commercial aerospace industry as China has so much young talent and the industry will have continued growth. 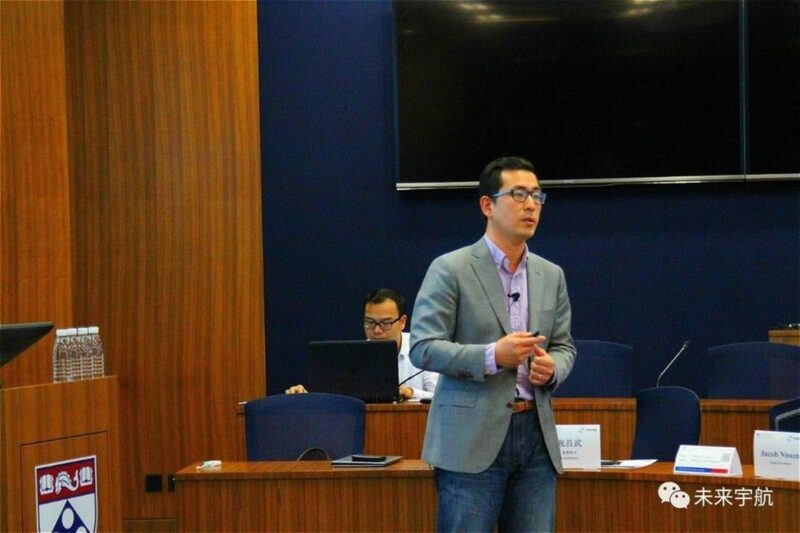 Wharton MBA alumnus Tony Zhang, WG’06, Partner of Kinzon Capital, happened to be in the area for business and attended the forum. He said the event exceeded his expectations and provided him with valuable insight on the aerospace industry. The Penn Wharton China Center grew out of a long tradition of Penn-China engagement that began nearly 200 years ago. Over these years, many partnerships knit together Penn-generated knowledge with universities, corporations, and other entities throughout China. These exchanges significantly increased the breadth and depth of China-related knowledge at Wharton and the other 11 schools that make up Penn, benefiting our students, alumni, and faculty in their academic and professional pursuits. Importantly, the exchanges also benefited China by helping train the country’s leaders in business, finance, architecture, medicine, and many other fields. The establishment of the Penn Wharton China Center in Beijing represents a heightened commitment by Penn’s and Wharton’s leadership to our mission in this part of the world. Why This Statistics Undergrad Spent Winter Break Volunteering in Washington, D.C.